Four-petaled flowers grow in round clusters that are usually 4 to 8 inches wide. Flowers bloom in white, lavender and pink. 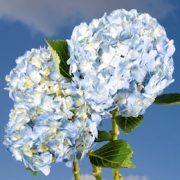 While the hydrangea has been a favorite in the garden or landscape for years, it has become a popular cut flower in wedding arrangements.